Alexa and Google Assistant have been taking over homes for a few years now, so it’s probably easier to name the companies that haven’t made a smart speaker. The options are seemingly endless. Audio gear that harnesses a virtual assistant comes in all shapes and sizes, with some making big claims about the quality of sound they get out of such small devices. 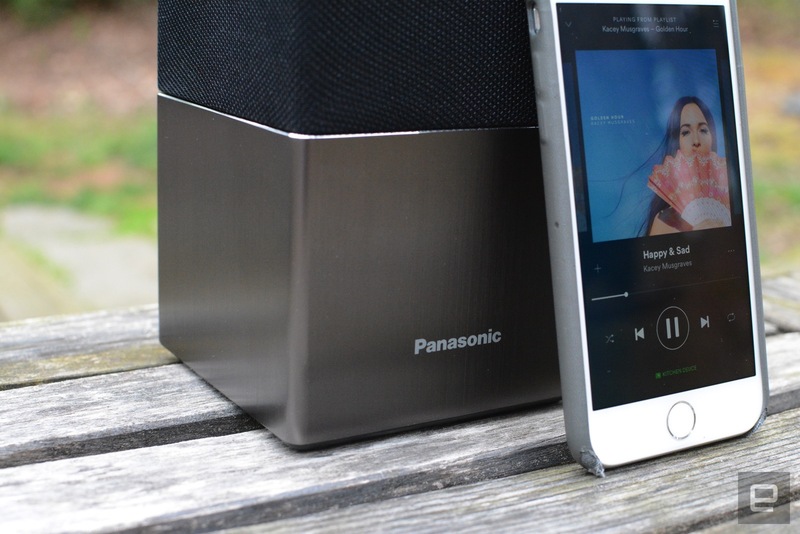 Panasonic is doing just that with its $250 SC-GA10; however, the company’s promise of “premium hi-fi sound” failed to make a lasting impression. A lot of smart speakers are round, cylindrical affairs, but Panasonic chose to go the boxy route with the SC-GA10. The speaker’s cube shape isn’t novel, but it’s different enough from a lot of the popular options (Echo, Google Home, etc.) that it feels somewhat unique. Sure, it’s rather plain, but I kind of like that. The GA10 blends in easily on a shelf, thanks to its unassuming aesthetic. Panasonic offers two color schemes for the SC-GA10: a mix of black and silver or white and silver. 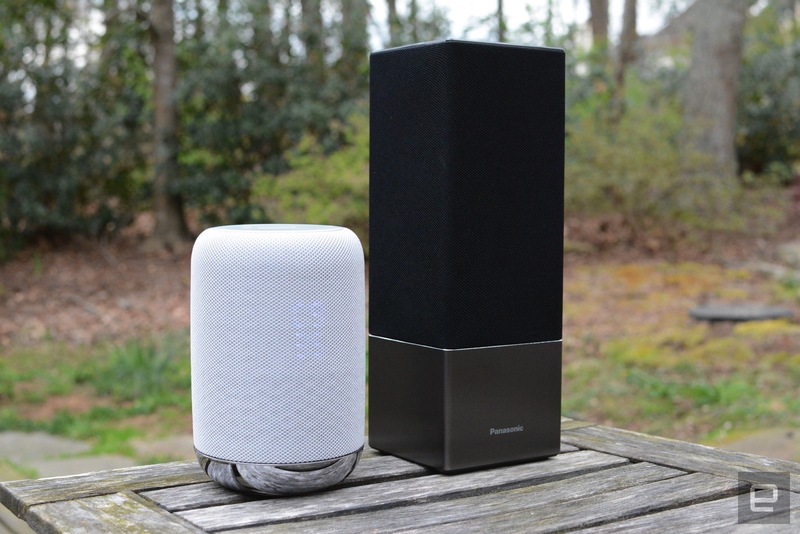 Both of those varieties are pretty standard fare for smart speakers. The SC-GA10’s look is simple, with some Panasonic branding on the front and power and auxiliary jacks around back. There are also a few white lights on the front edge: one stays lit when the speaker is on, while others light up in a row whenever Google Assistant is active. Other than those few items, this speaker is basically a box that looks a bit like a miniature tower speaker. As with many speakers, not just the smart ones, Panasonic put all of the physical controls up top. While this is the most convenient position, the height of the SC-GA10 poses some issues. All of the onboard controls are on a touch panel on the top of the speaker. There are controls for power, volume, muting the microphone, play/pause and several input options. So far so good… until you try to make any tweaks when the speaker is sitting at eye level (or above) — like on a shelf. Unless the SC-GA10 is sitting in a spot where you have a full view of the top, you really have no idea what you’re tapping. Play/pause is pretty easy to remember because it’s alone in the center, and I quickly learned the location of the volume controls, but there are no raised dots or anything to let you know which of the features you’re close to. This may seem like a small thing for some people, but for me it was frustrating. Sure, this is a voice-controlled speaker, and most of the time I just used spoken cues. For things like volume adjustments, though, I prefer to make the change manually rather than rely on Google Assistant. A lot of smart speakers, like Google Home and the Sony LF-S50G, solve this with gesture controls. There can be a bit of a learning curve with those as well, but you don’t have to worry as much about where you place those speakers, since you don’t really need to see the top. As frustrating as the gestures were on the LF-S50G at first, I found myself wishing the Panasonic SC-GA10 had them. When it comes to smart speakers, there’s a range of sound quality. While most aim to simply get the job done, others offer impressive audio in a compact device. Sonos One is a perfect example of the latter. With the SC-GA10, Panasonic promises “premium hi-fi sound” and tosses the word “supreme” around. But I found the sound to be mostly just… fine. It will certainly fill the void if you’re looking for a smart speaker, but if all you’re after is voice control, there are more affordable options, like Google Home Mini, Echo and Echo Dot. Even the Sonos One is $50 cheaper, and it offers both Alexa and better sound quality. The Sony LF-S50G and the Panasonic SC-GA10. While the audio on the SC-GA10 is crisp and clear, the EQ tuning is where Panasonic lost me. Across a range of genres, the sound lacks dynamics: the midrange is overemphasized, without the necessary amount of bass or treble. I noticed it most with bass-heavy genres like hip-hop. The low end is just muddy and lacks the punch or depth other speakers offer. At higher volumes, the EQ blends together and the overall audio quality is noticeably worse. There is a Panasonic app where you can make EQ tweaks, but in my experience, it didn’t offer much help. I’ll admit Sonos has spoiled me a bit, but the sound was noticeably better on the Sony LF-S50G too. With the claims Panasonic was making about the SC-GA10’s audio chops, I expected it to at least be comparable to the Sonos One. Instead, it’s just okay. Despite the clothlike material wrapping the entire top of the unit, the SC-GA10 isn’t a 360-degree speaker. Two tweeters are angled to the sides, and there’s a single subwoofer, but the sound is beamed entirely out of the front. Other smart speakers blast tunes in all directions, but even though Panasonic’s smart speaker looks like it does the same, that’s not the case. Of course, audio is just one piece of the equation here. Google Assistant is the main reason to consider the SC-GA10. I’m happy to report that the smart features, like voice control, work just fine for the most part. There were times when it had trouble picking up my commands, but that was rare and usually happened when the speaker was blasting music at a considerable volume. My wife had trouble with the speaker hearing her spoken queries more often than not, but I had far less trouble. Of course, my voice was programmed into the Google Home app, but that didn’t make a difference on other speakers I’ve tested. (The Sony LF-S50G even reliably understood my three-year-old.) Most of the time, though, the SC-GA10 picked up my voice cues without issue. And thanks to the Google Home app, setting up the speaker takes only a couple of minutes. At $250, the SC-GA10 is at least $50 more than a lot of its competition. If you’re looking for Google Assistant alternatives, Google Home is $129, and Sony’s LF-S50G is $200. The Sonos One currently works only with Alexa, but at some point it will also work with Assistant for $50 less than the SC-GA10. And of course, Amazon has a bunch of options at various price points if you don’t have a virtual assistant preference. 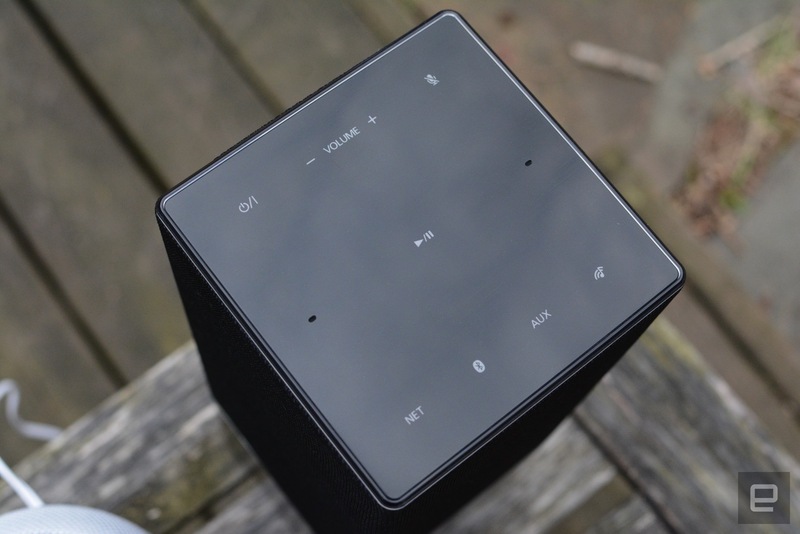 Again, in terms of overall sound, Sony and Sonos are better options. With all of the other options on the table, Panasonic’s SC-GA10 is a tough sell. Unless you really want touch controls on your smart speaker or just like the look of it, there are cheaper and better-sounding devices to consider. I’ll admit I like the design of the SC-GA10, but when it comes to audio gear, you can’t make decisions based on looks alone. Sure, Google Assistant does an admirable job here, but the mediocre sound quality and high price make this one of the less compelling additions to the smart speaker heap.